On July 15, 2000, my husband and I were married in rural Manitoba. That was fifteen years ago today. This is how our anniversary played out this morning. I adjust my duvet cover and look at Chris, who’s half a kilometre away in our king-size bed. “Hey, Happy Anniversary,” I say. I put on my glasses so I can roll my eyes more clearly. Our son William saunters into the bedroom and grabs the sequestered iPad. Will avoids eye contact and says “okay,” like I’ve just told him the school bus will be here in five minutes. He leaves with the iPad and no further comments on our crystal anniversary year. Chris and I glance at each other. I look back at Vivian and nod. So there it is. This is what fifteen years of marriage looks and sounds like. And I’m thinking it looks and sounds pretty good. All the best to both of you and what a great writing that Viv did…she sums it up! Enjoy your night out and celebrate 15 wonderful years…I think I will celebrate too! That is a very sweet message from your daughter. I’m sure you will save it and frame it. Congratulations! 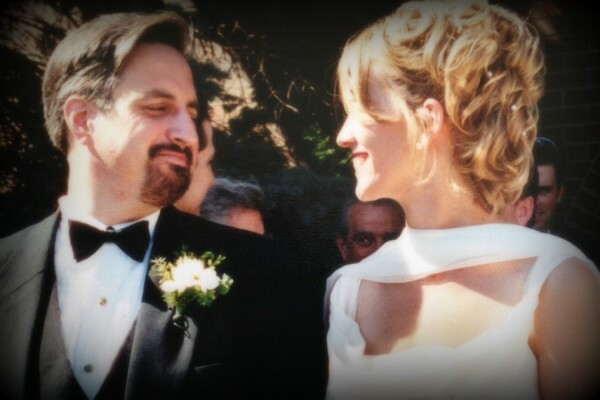 Happy Anniversary Leanne and Chris! Congratulations! I wonder where V gets her way with words? That’s awesome! I can’t believe how well she writes. Glad you two survived the boomerang adventures of North America to Asia and back again. Enjoy the medal and sainthood. Great post! It seems amazing idea. Thanks. Vivy’s words made Grandma tear up! And Will made her laugh! What a touching Anniversary message. Best wishes to all of you! Ha,ha. Happy anniversary. I look forward to 15 years!